Have you sworn off sleeveless shirts because of dark armpits? You’re not alone. Underarm discoloration (think: red or brown marks) is an issue that 32 million U.S. women experience and it's a major complaint at the dermatologist's office. It can be caused by frequent shaving, friction (if say, your workout clothes rub against your underarms), and irritation from your deodorant, says Jeffrey Benabio, M.D., a dermatologist in San Diego, California. Hormonal conditions, pregnancy, diabetes, and being overweight can also cause darkening. Some people swear by lemon juice as an at-home remedy, but it can take months before you notice a difference. 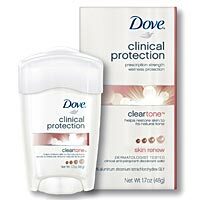 Instead, consider switching from shaving to waxing and opt for a gentle deodorant with moisturizing ingredients (like Dove Clinical Clear Tone Antiperspirant/Deodorant, $7-$10; mass retailers) that help speed up the skin's natural exfoliating process, evening tone, and eliminating darkness.